This article was written by University of Texas Arlington assistant men's basketball coach Zak Buncik. 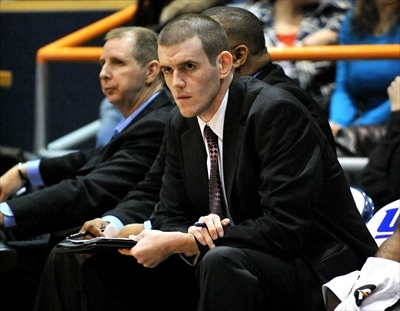 Coach Buncik has been a part of the UT Arlington staff since 2009. Zak also has coaching experience at the following schools; River Oaks Castleberry and Arlington Sam Houston. What separates a good player from a great player, and a great player from an elite player? The answer...toughness! Tough players play and play effectively no matter what! A tough guy plays through bad calls. He can go on the road in a hostile environment and does not let someone else dictate how his game is played. An elite player does not let a bad call effect how he plays his next possession. A good player does. An elite player takes the challenge of knowing he will get nothing handed to him on the road. A tough guy embraces a hostile environment. His mental toughness does not let the intensity of the fans get to him while he is shooting free throws. He is so mentally tough that it does not matter if it is a empty gym or a student section 5,000 strong...he knows the ball is going through the net every time, and then he's going to get a stop the next possession on the man he is guarding. A tough guy plays through fatigue. Any good player can be productive on the first game of a 3 game road trip, but an elite player can play better in the third game of the trip. He can do this because he does not let the body run the mind like a good player. An elite player lets his mind run his body, he knows the other nine players on the floor are just as fatigued as him if not more, but an elite player can convince and push his body far beyond what a good player can push himself. A tough guy plays through an injury (there is a big difference between pain and serious injury. Serious injury needs to be handled accordingly). He does not let the aches and pains of a season slow him down from going as hard as he possibly can on every possession. He takes care of his body in every aspect from rehab before practice to get him ready, and rehab after practice to make sure he is ready to go full blast the next day. He takes care of it by getting a proper amount of sleep every night for his body to recover from injury and time spent on the road. The good player turns an injury that should cause you to miss zero games into sitting out two games. The elite player turns an injury that should have you sitting two games into missing zero games. A tough guy does the little things. He talks on every possession. He always plays with energy. He watches extra film with a coach after a long, grueling practice. He gets up extra shots on his own before classes, between classes, and after demanding days on his body. He knows and understands the complete scouting report, not just the man he will be guarding. He holds himself and teammates accountable for all of their actions on and off the floor. He does not let personal pride stand in front of what is best for the team. I conquer with everything that was stated and wanted to add that every player has a certain level of toughness. There is the Mental, the Physical, and the Emotional…not to mention the Spiritual. As Coaches it is up to us to bring out the maximum in ALL areas. Over the years I come to agree with a quote from Tom Izzo “Players Play but Tough Players WIN”. Keep up the Great Work Coaches!!!! Agree with everything said but for young players and particularly 13/17 olds I would err on the side of caution with injury. Tough players can play carrying an injury and say they are not hurting but if this leads to a long term problem a coach is not doing the player’s long term future any good or his own reputation if he wins a district title and wrecks a future NBA stars career by over playing an underlying injury. My players are all very tough but that quote from Coach Cross at the end revealed a glaring weakness. We simply do not take pisses tough enough. That will be the focus of practice all week.